In my reporting of the September 2017 Metrolinx Board Meeting, I reviewed a presentation on Regional Fare Integration. At the time of writing, only the summary presentation to the Board was available, but the full Draft Business Case appeared some time later. This is the sort of timing problem that Metrolinx has vowed to correct. A basic problem with such a delay is that one must take at face value the claims made by staff to the Board without recourse to the original document. This will mask the shortcomings of the study itself, not to mention any selective reinterpretation of its findings to support a staff position. In the case of the Regional Fare Integration study, this is of particular concern because Metrolinx planners clearly prefer that the entire GTHA transit structure move to Fare By Distance. However, they keep running into problems that are a mix of organizational, technical and financial issues, not to mention the basic politics involved in setting fares and subsidies. If FBD is presented as the best possible outcome, this could help overcome some objections by “proving” that this is the ideal to which all systems should move. At the outset, I should be clear about my own position here. The word “Bogus” is in the article’s title not just because it makes a nice literary device, but because I believe that the Fare Integration Study is an example where Metrolinx attempts to justify a predetermined position with a formal study, and even then only selectively reports on information from that study to buttress their preferred policy. The study itself is “professional” in the sense that it examines a range of options by an established methodology, but this does not automatically mean that it is thorough nor that it fully presents the implications of what is proposed. The supposed economic benefit of a new fare scheme depends largely on replacement of home-to-station auto trips with some form of local transit (conventional, ride share, etc) whose cost is not included in the analysis. This fundamentally misrepresents the “benefit” of a revised fare structure that depends on absorption of new costs by entities outside of the study’s consideration (riders, local municipalities). The set of possible fare structures Metrolinx has studied has not changed over the past two years, and notably the potential benefits of a two-hour universal fare are not considered at all. On previous occasions Metrolinx has treated this as a “local policy” rather than a potential regional option, not to mention the larger benefits of such fares for riders whose travel involves “trip chaining” of multiple short hops. One must read well into the report to learn that the best case ridership improvement from any of the fare schemes is 2.15% over the long term to 2031, and this assumes investment in fare subsidies. Roughly the same investment would achieve two thirds of the same ridership gain simply by providing a 416/905 co-fare without tearing apart the entire regional tariff. In either case, this is a trivial change in ridership over such a long period suggesting that other factors beyond fare structure are more important in encouragement or limitation of new ridership. Moreover, it is self-evident that such a small change in ridership cannot make a large economic contribution to the regional economy. The Board Presentation gives a very high level overview of the draft study. “Significant” is the key word here, and this is not supported by the study itself. Ridership gains due to any of the new fare structures, with or without added subsidies, are small, a few percent over the period to 2031. The primary economic benefit is, as the draft study itself explains, the imputed value of converting park-and-ride trips to home based transit trips thanks to the lower “integrated” fare for such services, encouraged possibly by charging for what is now free parking. However, local transit (be it a conventional bus, a demand-responsive ride sharing service, or even a fleet of autonomous vehicles) does not now exist at the scale and quality needed, and this represents a substantial capital and operating cost that is not included to offset the notional savings from car trips. Fare by distance does perform “better” than the alternatives, but none of them does much to affect ridership. Moreover, the fare structure, to the limited extent that the study gives us any information on this, remains strongly biased in favour of cheaper travel for longer trips. An unasked (and hence unanswered) question is whether true fare by distance and the sheer scale of the GTHA network can exist while attracting long-haul riders and replacing their auto trips with transit. This is only a modest set of goals compared to a wholesale restructuring of the regional tariff, and it includes much of what is proposed by “Concept 1” in the study – elimination of the remaining inter-operator fare boundaries, restructuring GO fares (especially those for short trips) to better reflect the distance travelled, and harmonization of policies such as concession fare structures and transfer rules. Further consultation is to follow, although as we now know, the first of the four steps has already been approved by TTC and Metrolinx. Without more co-ordinated inclusive decision making, agencies’ fare systems are continuing to evolve independently of one another leading to greater inconsistency and divergence. This statement is not entirely true. The GO-TTC co-fare is an indication of movement toward fare unification, although the level of discount offered on TTC fares is considerably smaller than the discount for 905-GO trips. That distinction is one made by the provincial government as a budget issue, and it cannot be pinned on foot-dragging at the local level. Assuming that Toronto implements a two-hour transfer policy later in 2018 (and the constraint on its start date is a function of Presto, not TTC policy), there will be a common time-based approach to fares across the GTHA. All that remains is the will to fund cross-border acceptance of fares (actually Presto tap-ons) regardless of where a trip begins. Without question, there should be a catalog of inconsistencies across the region, and agreement on how these might be addressed, but that will involve some hard political decisions. Would Toronto eliminate free children’s fares? Would low-cost rides to seniors and/or the poor now offered in parts of the 905 be extended across the system? Will GO Transit insist on playing by separate rules from every other operator as a “premium” service? These questions are independent of whether fares are flat, by distance, or by some other scheme as they reflect discount structures, not basic fare calculations. “A consideration” is less strong language than saying that FBD should be the target framework. If this is to be, then Metrolinx owes everyone with whom they will “consult” a much more thorough explanation of just how the tariff would work and how it would affect travel costs. The draft report is quite threadbare in that respect with only one “reference” tariff used as the basis for a few fare comparisons, along with a caveat that this should not be considered as definitive. That is hardly a thorough public airing of the effects of a new fare structure. No convincing rationale has been advanced for moving to a full fare by distance system, including for all local travel, and it persists mainly because Metrolinx planners are like a dog unwilling to give up a favourite, long-chewed bone. At least the draft study recognizes that there are significant costs, complexities and disruptions involved with FBD, begging the question of why it should be the preferred end state. Amend [GO Transit fares] to address short/medium trips and create a more logical fare by distance structure based on actual distance travelled instead of current system to encourage more ridership. 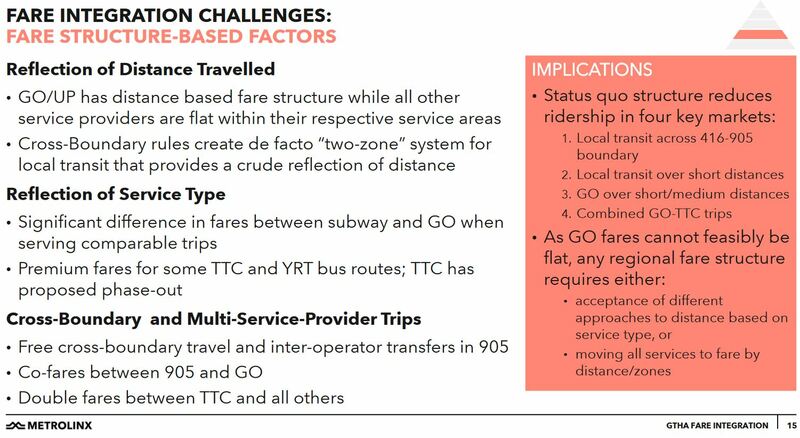 Lowering fares for short trips will encourage demand on a part of the GO system that overlaps the local TTC system, and will require capacity on GO that might not be available, especially in the short term before full RER service builds out. True FBD will increase long trip fares on GO and discourage the very long haul riders whose auto-based trips GO extensions were intended to capture. The reference tariff implied by sample fares in the draft report is most decidedly not FBD with short haul fares at a rate about four times that of long hauls. In other words, the goal as presented to the Board does not match the actual sample fare structure used in the draft study. GO/UP uses tap on/off, other agencies are tap on only. Emerging technological solutions may allow tap on-only customer experience while maintaining compatibility with fare-by-distance or –zone structures. The technology in question, as described in the study, would require all Presto users to carry a GPS enabled device that could detect their exit from vehicles automatically without the need to physically tap off. This requires a naïve belief that all riders will carry smart mobile devices to eliminate the congestion caused by a physical tap on/off for all trip segments, and is is a middle-class, commuter-centric view of the transit market. Several issues are listed here that reflect the complexity of a system where the lines between local and regional service have already started to blur, and where simplistic segmentation of classes of service simply do not work. The argument implicit in this is that only a zonal or distance based fare will eliminate many of the problems, but there is no discussion of the benefits obtained simply by a cross-boundary co-fare plus time-based transfer rules to benefit multiple short-hop trips. This demonstrates the blinkered vision at Metrolinx and a predisposition to distance-based “solutions”. There are major gaps in the analysis and presentation of the Draft Report. By the end of the study, it is abundantly clear that the target scheme is FBD and future work will aim in that direction. Metrolinx’ FBD goal has not changed, and this begs the question of how any sort of “consultation” can or will affect the outcome. The remainder of this article examines the 189-page Draft Report and highlights issues in the analysis.